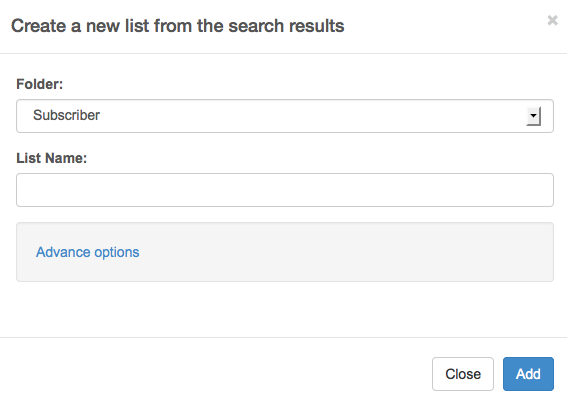 A list with specific contacts from a search: Segment specific contacts from SendinBlue's powerful search engine. This is very useful for creating specific lists. For example, searching for all openers from your last campaign to make a list of contacts that you know could open your next campaign. A list with random contacts: You can extract a random segment from your database. You define the size and your result will consist of randomly selected contacts. This can be useful for testing your email with a small random segment before sending it to all your contacts. You can also combine these two segmentation types. Begin by going to your "Contacts" dashboard. Click on "Advanced Search & Segmentation". You can choose which contacts to search. Search only within a single list or search "All Contacts". Next, select your search criteria. These search preferences will filter your search results. Learn more about the different types of search criteria in this tutorial about searching for contacts. If you want to segment a random sample without excluding any contacts from your list, do not add any condition to your search. Select all the search results by checking the box to the left of "Email Address". Open the "Action" dropdown menu, click "Copy to list", and select "New list". You will then see the following window for creating your new list. Choose a folder in which to place your new list and give your new list a name. Good to know: Your search must return at least one result in order to create a new list. If your search does not yet return results, try creating and saving a Filter instead. 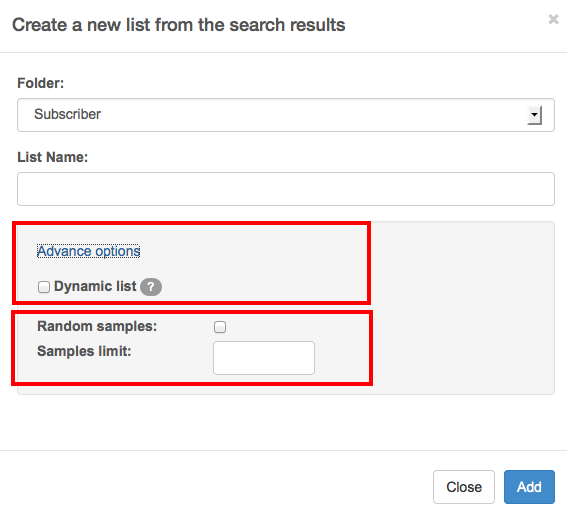 If you want to create a dynamic list (whose contacts are updated every day using your search criteria), click on "Advanced Options" then select "Dynamic List". If you want to create a random sample segmented from your list, select "Random Samples" followed by the amount of contacts you want. Finalize your list by clicking on the "Add" button and confirm your list. Your new list has been created! You can now view and edit your list on the "Lists" dashboard. Have a question? Email us you have any questions or issues.